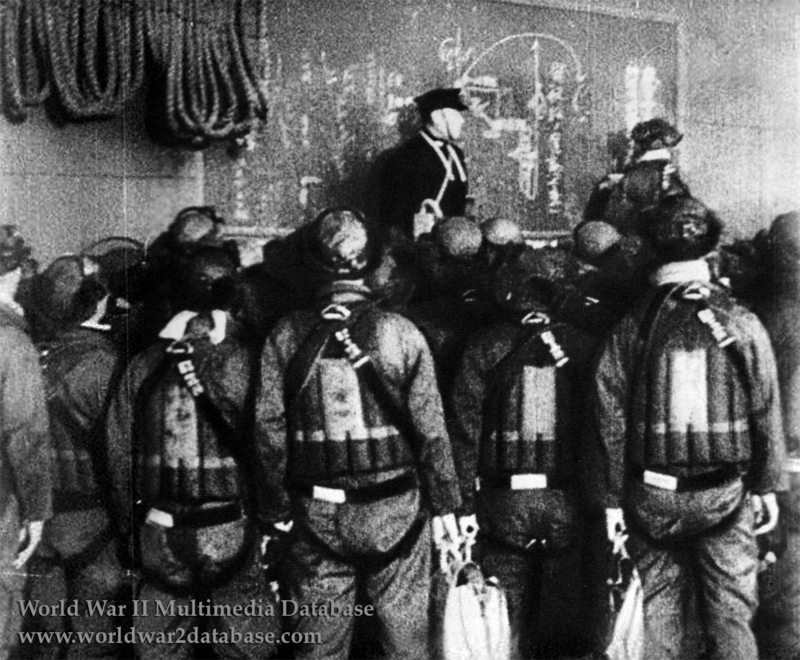 Japanese pilots are briefed at 0550 Hours on board IJN Shokaku just prior to takeoff on the morning of December 7, 1941. Imperial Japanese Navy Captain (later Rear Admiral) Takatsugu Jojima (June 20, 1890 - October 9, 1967) and Strike Leader Commander (later Rear Admiral) Tetsujiro Wada (January 31, 1904 - October 29, 1945) are providing the pilots with the latest weather information and positions of ships in Pearl Harbor as of 1030 Hours December 6 Hawaii Time. The pilots wear Type 89 Model 3 harness, which has their names (in the white space) and units (on the black harness strap) written on the back.